We in the UK thought we no longer had a mining industry, and it’s taken the deaths of four miners earlier this month at a Swansea Valley mine and of Gerry Gibson on Tuesday at the Kellingley Colliery in North Yorkshire (where three miners have now died in three years) to remind us that we do. William Morris’s family fortune itself came from mining, though of copper rather than of coal, and he would presumably have known of the great Victorian mining disasters: 361 dead at Oaks Pit, Barnsley, in December 1866; 209 dead at Blantyre Mine in Lanarkshire in 1877; 295 dead at the Albion Colliery in Glamorgan in 1894. And in April 1887 Morris was speaking as a Socialist leader to some 6000 striking miners at Horton in Northumberland. 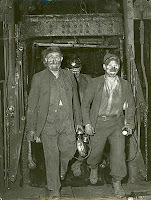 As I’ve noted before in this blog, my paternal grandfather and his sons, my Uncles Harry, Jack and Bill were all miners; and Grandad, unlike my uncles, was an active member of the Communist Party into the bargain. Years ago when I took my Mum and Dad to Blenheim Palace in Oxfordshire, Churchill’s birthplace, my father was rigid with anger and hatred because ‘Churchill wanted to shoot your Grandad’, i.e. had in 1942 wanted to turn the army on the striking miners at Betteshanger Colliery in Kent, where Grandad worked. So this Communist family background gives a strange resonance to current attempts by philosophers like Alain Badiou and Slavoj Zižek to reinvent ‘the Idea of Communism’. Some of Badiou’s formulations about the nature of personal political commitment are very stirring; and one can certainly understand why he wants to separate off a Platonic Idea of Communism from the Leninist party-form or the Stalinist State. The question is then what new organisational forms might become possible and appropriate (and, crucially, effective) when you do so; and that is an issue in which we shall surely find Morris’s own political thought – libertarian, decentralist and utopian but still emphatically socialist rather than anarchist (indeed, self-declaredly communist too) – as offering help and stimulus even today. Just wanted to point out, in response to queries, that the image with this post is indeed of my grandfather's pit, Betteshanger Colliery, near Deal in Kent. 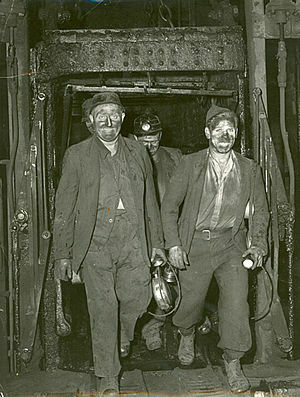 And since it's a photo from the early 1960s, Grandad himself might have been coming off the shift just behind these men! Thanks for this post. I know a reasonable amount about the Arts and Crafts movement, but I have never thought about where family money came from. That William Morris’ family fortune came from mining might have been embarrassing for young William, but presumably it was important in creating the man he became. For my maternal grandparents, the Russian Revolution was the highlight of their lives. Mum and her siblings were still singing The Internationale in Australia until Stalin.